Volunteers In Medicine relies on the collective effort of volunteer support in a range of medical and administrative areas to keep the clinic running. Volunteers contribute to our daily operations and our long-term mission of ensuring that low-income, under-served Clackamas County residents have access to quality health care. We are always in need of nurses, doctors, physician’s assistants and other healthcare professionals to provide medical care to our patients. 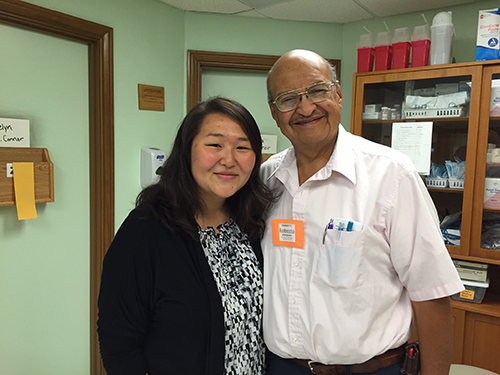 Volunteers are the foundation and critical component of the clinic’s day-to-day operations. If you are interested in volunteering, please call our clinic at 503.722.4400 or click below to apply. We are actively recruiting for the following Volunteer Positions. *Special needs list is highlighted in red. In particular around our annual luncheon fundraising event on Friday , April 26th. We will need help with mailings prior to the event, support with table registration and donation receipt on the day of the event, and data entry/acknowledgement letters after the event. CVIM is compiling a team of grant writers to respond to grant opportunities throughout the year. We are looking for volunteers with grant writing and project management skills. CVIM is looking for volunteer IT support to help us maintain our computers and phone system. A generous organization has donated a NEC (necphonesystems.com) phone system to CVIM, and we need someone to install the system. CVIM has 51% native Spanish speaking patient population and we are in need of Bilingual volunteers with an understaning of the principles of interpretation to work in the exam rooms with our monolingual, English speaking providers. Our volunteers do not need to be certified medical interpreters but certification is preferred. Supports the patients and providers of the clinic by escorting patients throughout the clinic to the exam room or lab, recording vital signs, documenting in the patient’s medical record, cleaning exam room after patient use, and stocking supplies in exam rooms. Must be licensed physicians or nurse practitioners. We use general providers and specialists. Front desk personnel welcome and check patients in, answer and direct phone calls and schedule appointments. As the welcoming faces of the clinic, front desk volunteers provide information regarding our organization and community resources for anyone who walks through our front doors. Interpreters provide translation at the front desk and for medical staff. Interpretive services may involve face-to-face interaction, communication via phone or writing. Laboratory volunteers collect blood and urine specimens for processing as required by medical personnel orders. The lab assistant performs CLIA-waived testing in support of patient care, and performs quality control on CLIA-waived tests. Volunteers work alongside our physicians to chart patient encounters using our electronic medical record system. The position involves direct patient contact and provides experience for volunteers looking to enter healthcare. Screeners determine patient eligibility for clinic services by verifying residency and income requirements. The position allows volunteers to learn about the Oregon Health Plan, community resources and social services.